anyone changed their clutch and bought the clutch centering tool and do not need it? I would like one to fit a G5 V1000. as i need to change the main oil seal. after all the good advice I am going to use the gear to align the clutch, and replace the gearbox input seal too - thanks. This year was the very first time I used a clutch centring tool I bought mine the tool to hold the Gearbox cog I saw one made from old clutch centres with a bit of flat bar bent and welded to them brilliant idea For year all I did was take off the gearbox centre and use that However if you are going to keep a Guzzi for years , well worth buying a centring tool makes live easy. thanks for the advice, I am keeping it for a long time, i have a drip from the bell housing drain hole. just one or two after every ride. but as the G5 is with me for a while i thought I would find the source. the clutch is good it looks new, it is an 'AP' brand. 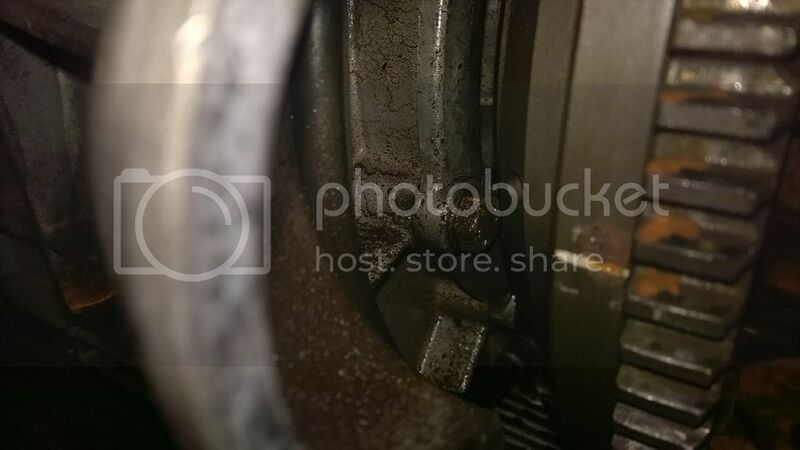 I guess that it was fitted without changing the main bearing rear seal. Could be the rear crank seal but, sometimes a perished pipe to/from the breather on top of the engine can leak into the clutch housing down the outside of the metal fitting. it runs into the housing at the top and back out the bottom. I don't know what breather arrangement you have but I think you'll still have a connection here. i had better look before pulling the clutch, the breather looks the same as the one in the picture but not as clean . I do not get oil in the breather lines and the can and flapper in the can are all in place. wouldi it work if i have a blow down the pipe and see if any oil comes out in the back of the fly wheel ? i am not sure how the oil would get into the bell housing, but i am hoping it is that and i can leave the clutch in place. 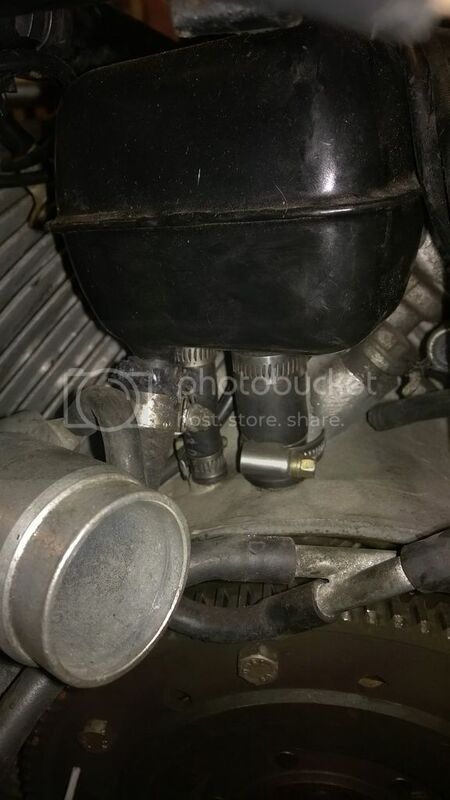 ^ What John said, oil leaks can run into the bellhousing thru the holes that the big and small metal pipes come out of, as they're by no means a tight fit in the casing, then there's nothing to stop it going all the way to the bottom. What would be leaking is one or other of the hose connections to the collector box. These pipes get tired and hard with age and won't stay tight, or split. i will clean down the back and replace the hoses if they look bad, run it then recrab the frame in a few hundred miles if the leak comes back. i will know if it is if it looks to be the pipe area or main seal. a pair of new hoses will be more expensive than the seal i bet.. .. If it's got the Le Mans collector bax as per photo above, then any general purpose type hose that will fit, only prob I had was finding the big bore stuff but I did on eBay. i have cleaned behind the clutch, I can either run it and see if i can see the leak or take the clutch off and replace the seal on the bearing and all the oil/air pipes. is the clutch easy to align with a taper clutch tool or do i absolutely need the toothed guzzi installer ? There is one on Ebay at the moment, but you must check it has the right spline. I suspect it's a shallow spline and yours should be a deep spline. I've just replaced the clutch and rear crank seal on my T3. The only special tool I used was a castellated socket to remove the gearbox input boss. 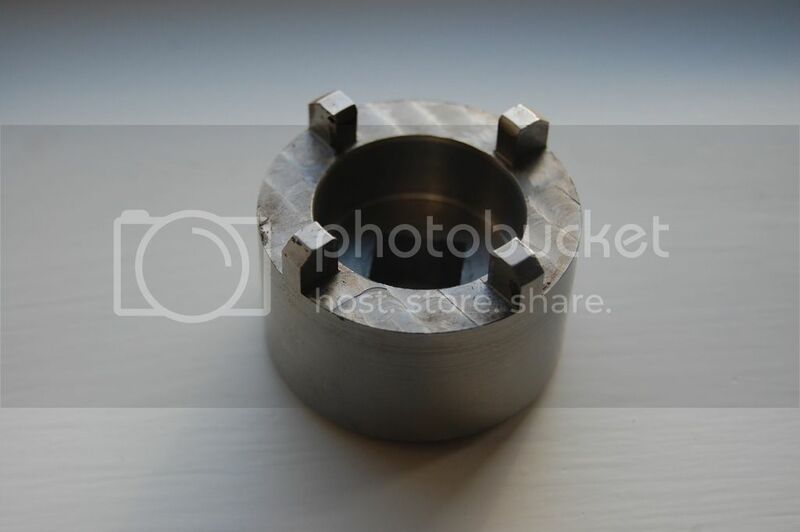 This can be used well enough to centre the clutch plates when tightening down the clutch. You just have to be careful to make sure the plain plate engages with the flywheel, but it's not difficult. I saw the socket on ebay for £15. Superb quality. I think the guy must make them himself. PM me if you want his ebay details. I think the Haynes manual says you can use the gearbox input splined boss, with a long bolt. The issue is that the TWO friction plates must not only be centred, but that their spline teeth also line up, when tighteing down the flywheel ring plate. thanks I will take off the gear spline and use it to align the clutch, that way i do not nee to find if i have a deep or shallow spline or course teeth. I will get the tool to take it off.